And here's my Berlin buddy Tobias Rapp with his debut Lost and Sound: Berlin, Techno und der Easyjetset for the prestigious Frankfurt publishing house Suhrkamp. 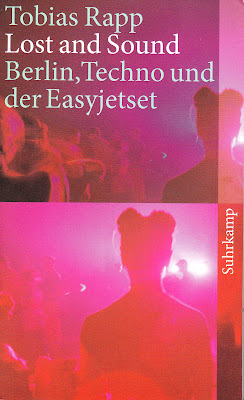 Being that it's in German I can't understand a bleedin' word of course, but from what Tobias has told me, it looks to be a fascinating study of the phenomenon of raver tourism in Berlin. Ultra-cheap air fares from Easyjet and Ryan Air et al have created this sort of Euroraver class, who fly into Berlin, don't bother with booking a hotel because they're not planning on doing any sleeping, and instead spend the money they save on partying hard . An entire micro-economy has sprung up to cater to these weekend warriors flying in from every corner of the Continent. Looks like Lost and Sound may get translated into English, in which case I'll alert you.